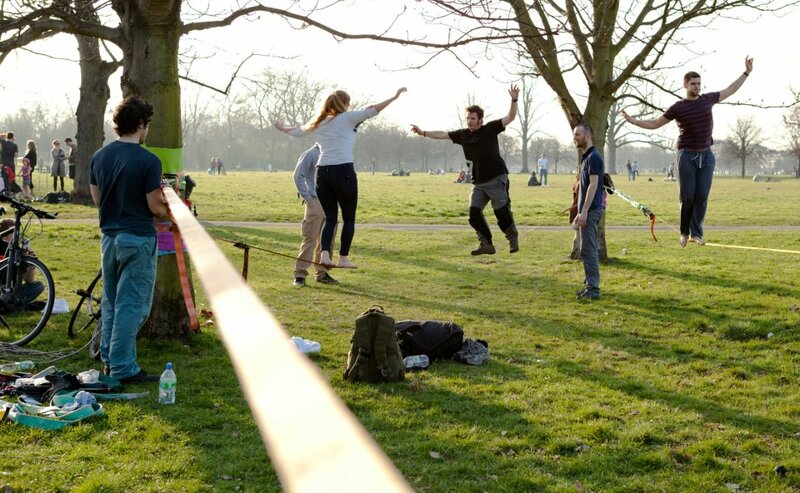 March 24th has officially gone down in history as yet another inspirational day for slacklining in London! One of the little stars of the day! 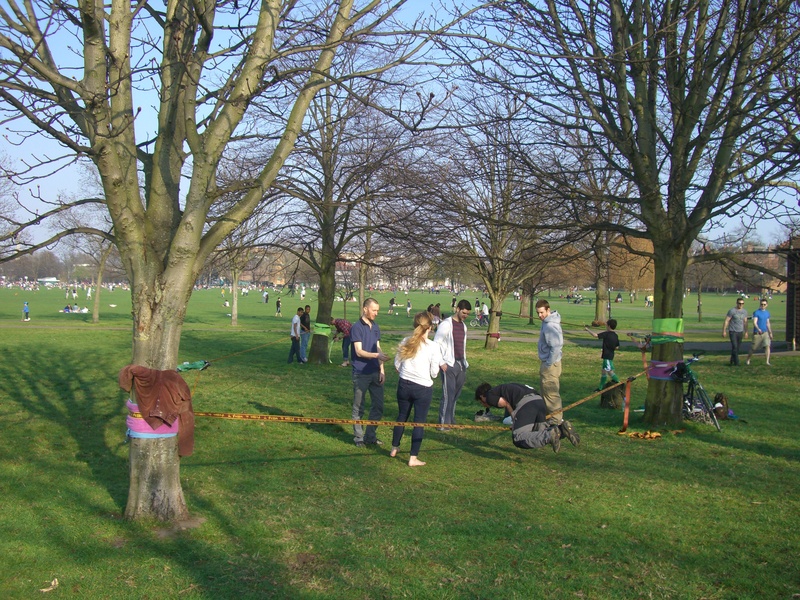 I organised an informal slackjam on London’s Clapham Common for slackliners and members of the public to come and try various lines and have lots of fun..and wow, what a positive response! 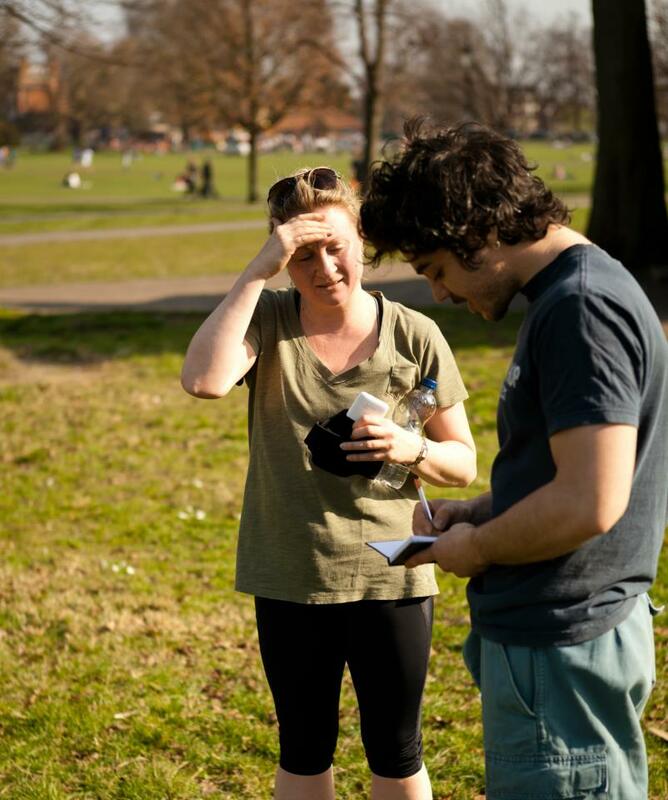 From midday until sunset, positivity was just flowing from everyone. 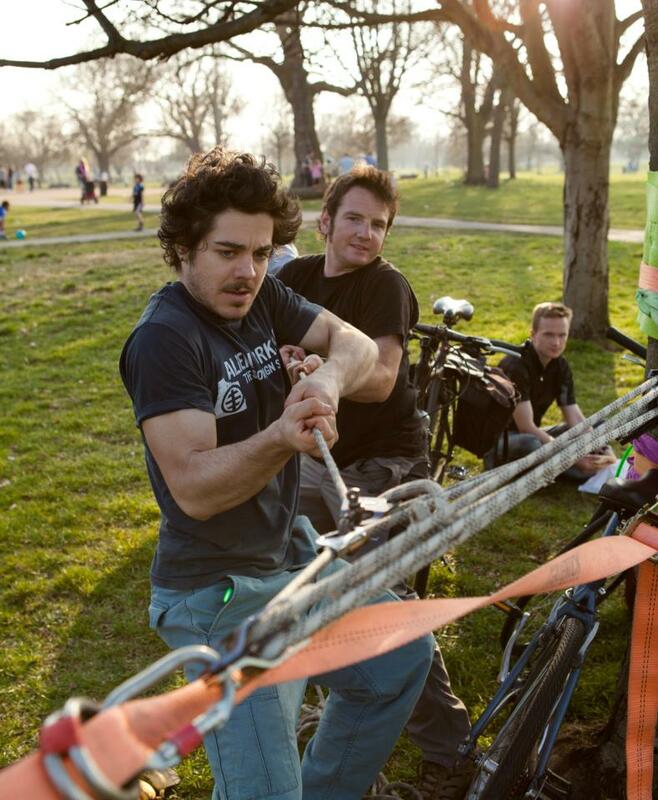 We set up four slacklines right by the café on the common – a little strategic on my part, I must say. 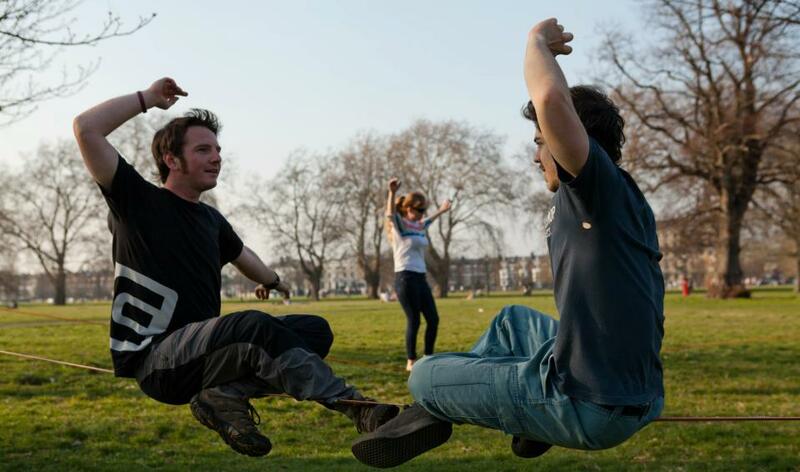 Lunch-timers paused through their half-chomped mouthfuls to witness what at first sight looked to be bodies levitating in thin air…only to resume chewing and bring out a smile as the line appeared in view, one of us walking from one end to the other. Then the queues of kids began to tail back. “Can I have a go!! 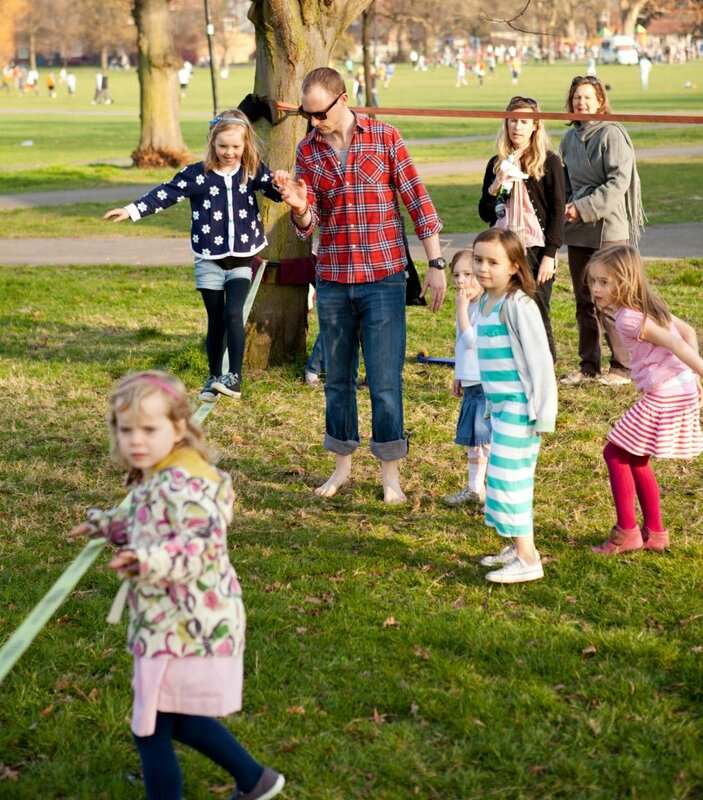 ?” came the cries from groups of minis just itching to get on and extend their Saturday playtime. 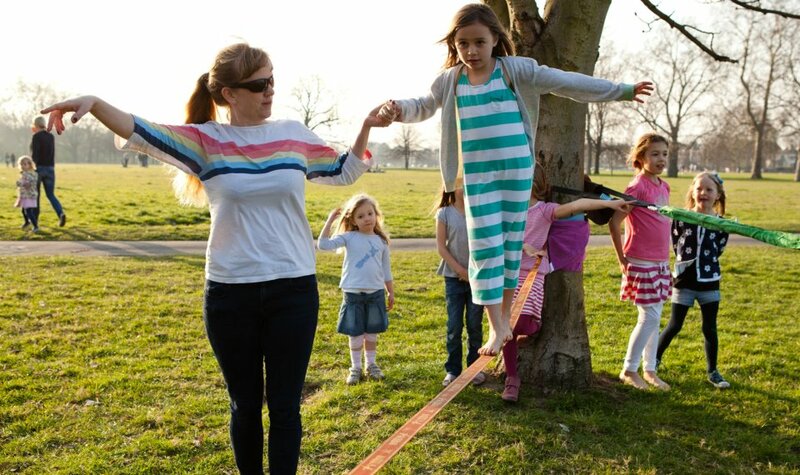 We all got together and helped out the little ones to walk the line, much to the parents delight! Such incredible skills from people so young! I spoke to the chef from the café on his lunch break and he was so stoked to see something so different during his much needed pause from the mad lunch-rush. The police out on the beat couldn’t resist slowing down, to look for themselves if what they were witnessing was really humanly possible!? 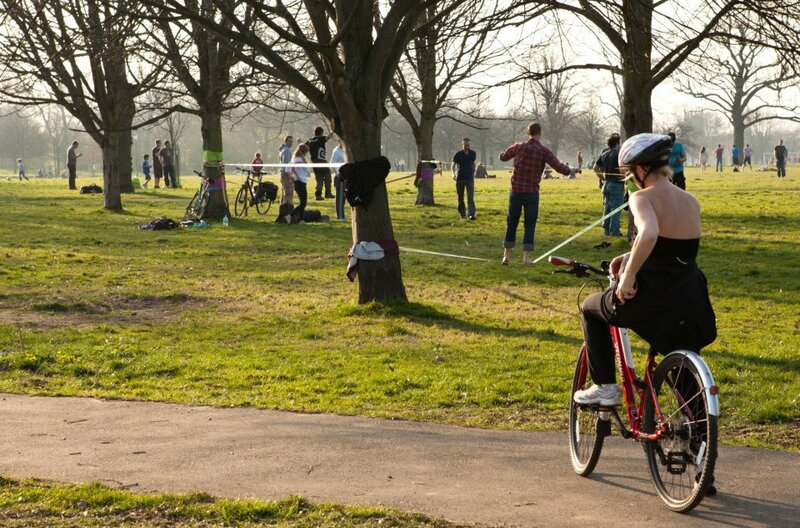 Who can stay on the longest...? 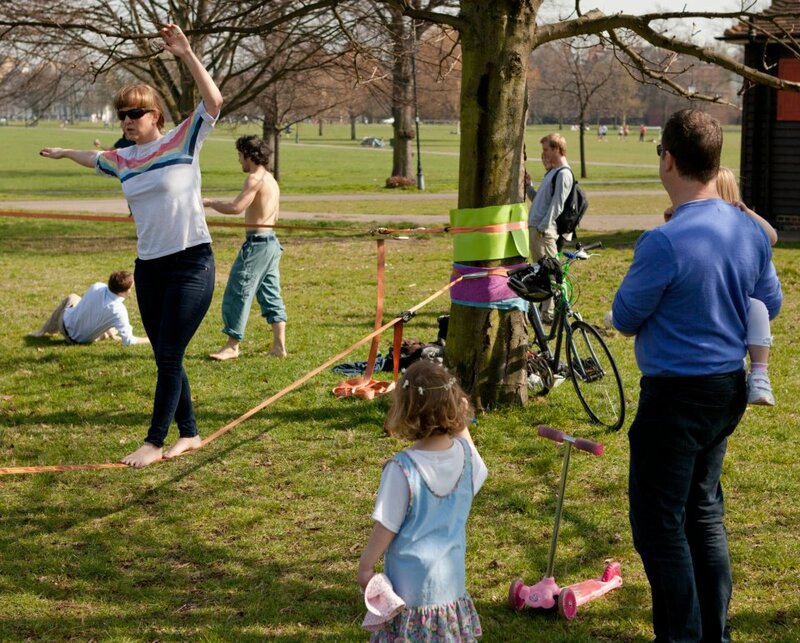 I even had the pleasure of meeting one of Clapham Common’s User Committee key members who was out with family and friends, and had a great chat with him about making slacklining more readily available to all on the common. 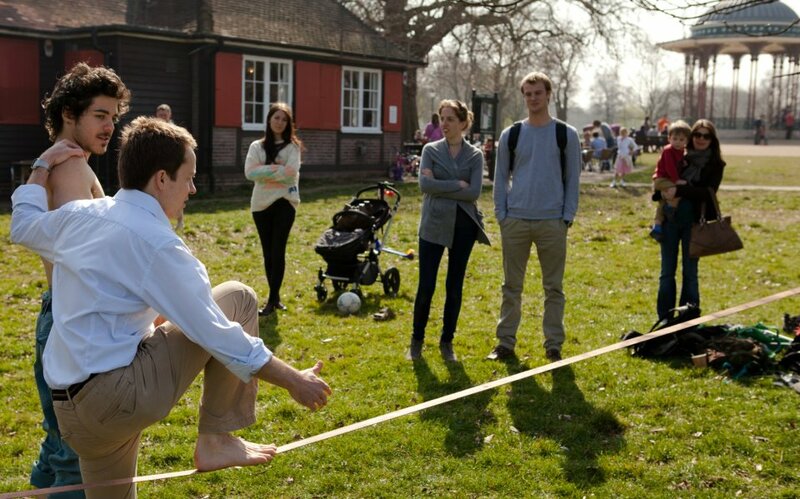 All whilst he watched his little one walk the line. 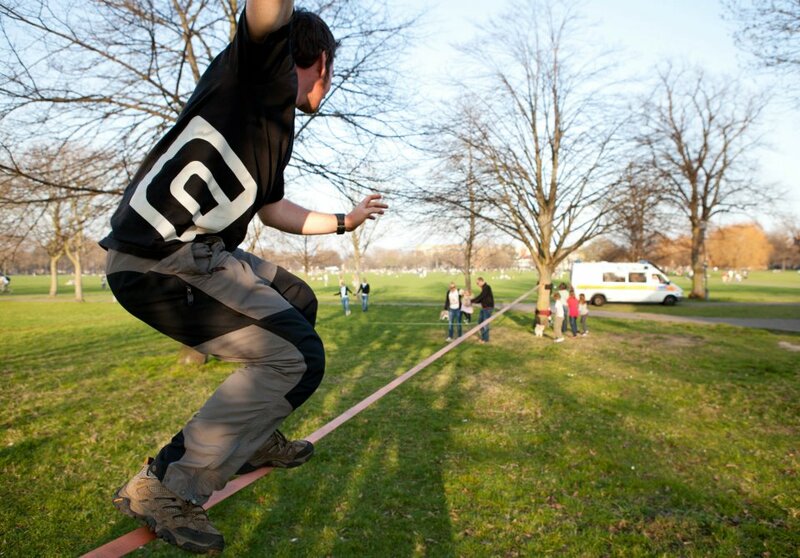 Slacklining is on the up! 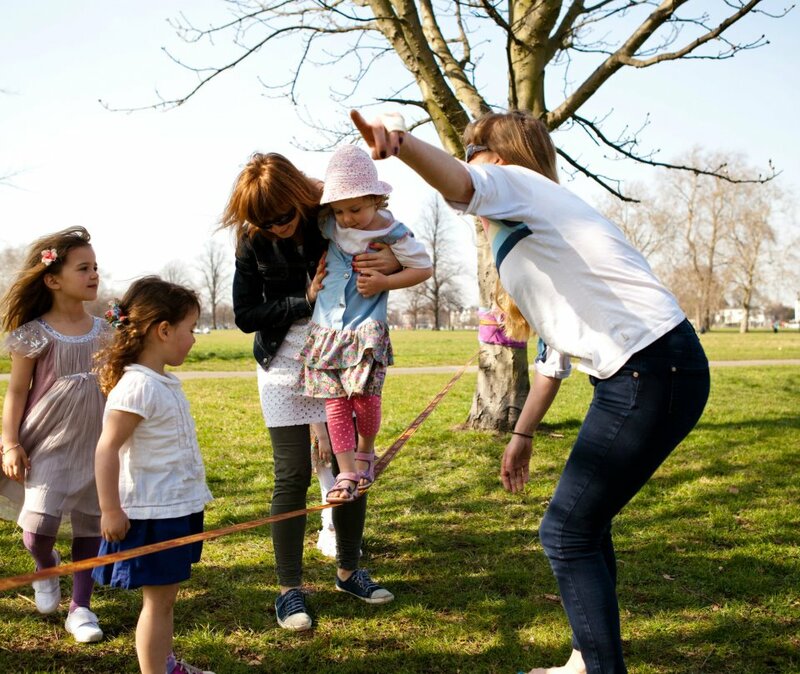 If you’re out on Clapham Common and spot us playing around, come over and have a go! 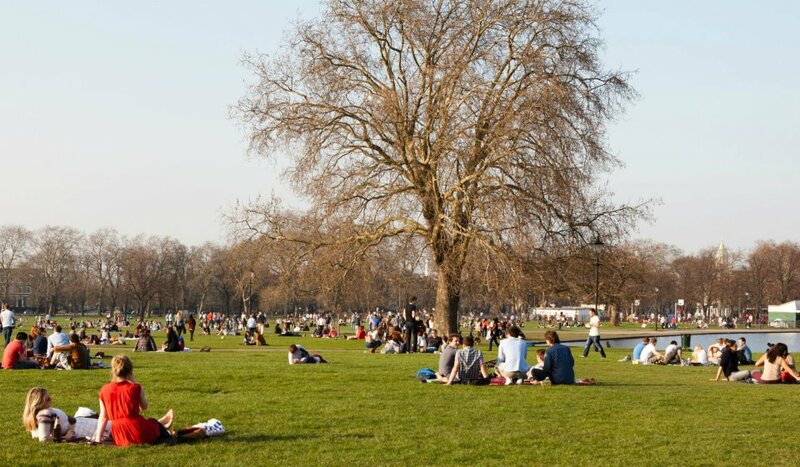 Thanks to everyone that helped out today, not only for making my day fun, but for picking up all your litter and protecting all the trees with padding! The remaining few.. "What a great day!" Fantastic effort all round. Let’s do this every Saturday! 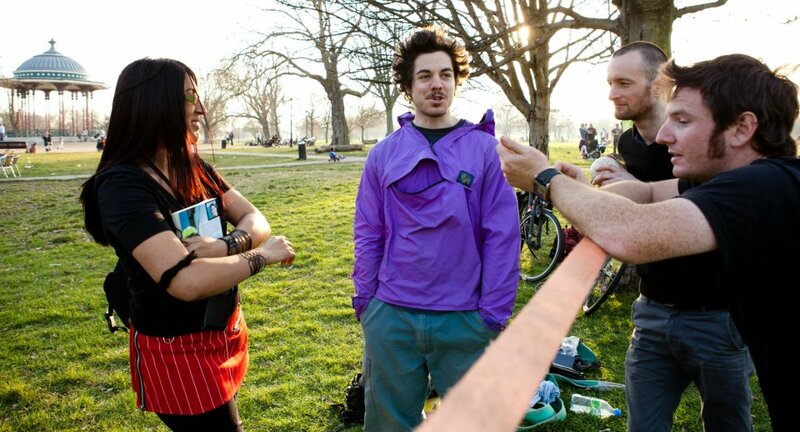 Harry Cloudfoot is a slackline instructor based in London. To book him for events or workshops, contact him here. 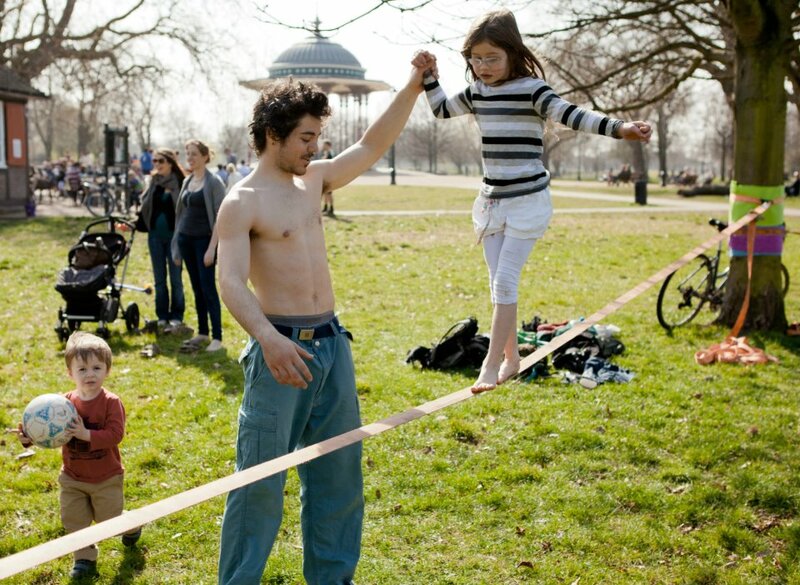 This entry was posted in Events, Slacklining and tagged Clapham Common, community fun day, harry cloudfoot, kids club, Lambeth, london, slackline, slackline class, slackline classes london, slackline instructor, slackline workshop, slacklining, slacklining workshops, Wandsworth by harrycloudfoot. Bookmark the permalink.